Today we celebrate the solemnity of Corpus Christi, and I’m reminded of a similar day I celebrated many years ago. At the time, a friend of mine from out of state was visiting me and my family. He was Protestant but was happy (and curious) to join us for Mass and the Corpus Christi festivities. After Mass, there was a procession of the Eucharist in the monstrance and my friend wanted to know why the “bread” was being carried around in a large ornate gold holder. Further, why were people acting as if it were God? All these years later, I still remember the look on his face and the sound of his voice. It made an impression on me because it reminded me of the depth of the Eucharistic miracle and the depth of Jesus’ love for us. Not only did Our Lord come down from Heaven to redeem us and bring us everlasting life, He humbled Himself enough to become the very food we eat. I don’t ever want to become complacent towards Jesus in the Eucharist. One of the ways I fight against it is to stop by our parish chapel whenever I drive by it. I’ll pop in for a few minutes to kneel before Jesus in the tabernacle. I close my eyes and picture Him sitting there while I’m at His feet. Sometimes I pour out my heart to Him and sometimes I just let him know that I love Him and didn’t want Him to be alone in the chapel. It’s a small way to grow my love for Jesus in the Eucharist. This week think of something you can do to thank Jesus for coming to you in the Eucharist. You could go to Mass an extra day, invite a non-practicing friend to go with you, visit Jesus in the tabernacle, or make a spiritual communion during the busyness of your day. 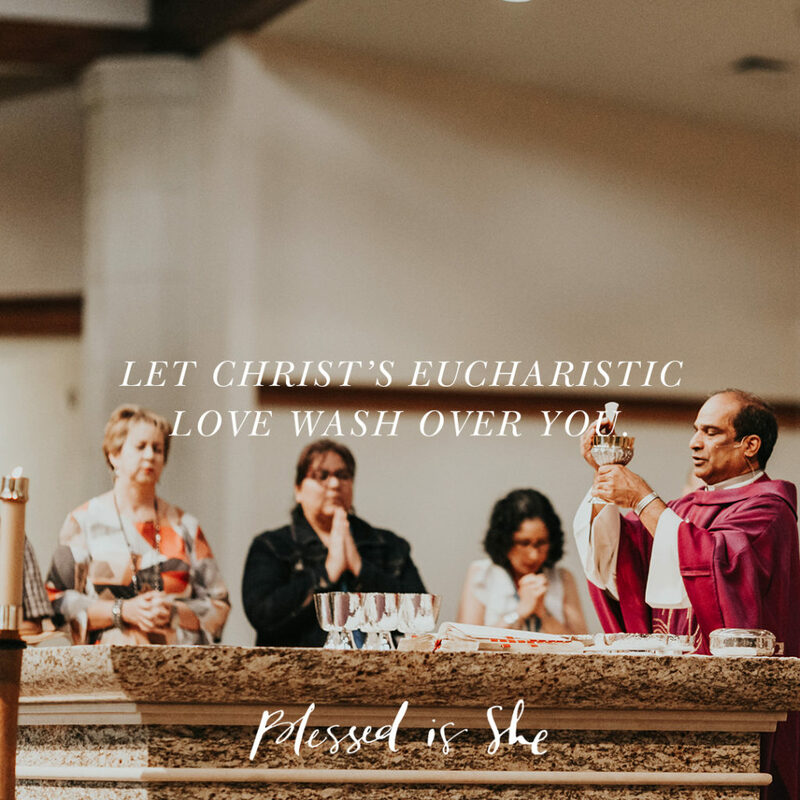 Whatever it is, stop and take a moment to let Christ’s Eucharistic love wash over you.